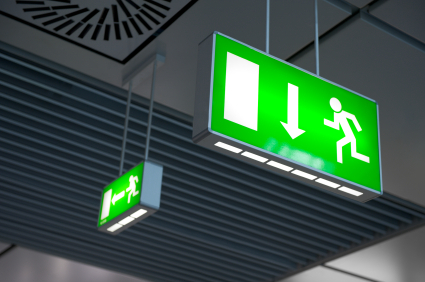 Falcon Electrical Contractors offer their Emergency Lighting installations nationally. Currently almost 100% of commercial buildings or high occupancy residential buildings MUST have an Emergency Lighting solution. In the event of a buildings general power failing especially at night, without Emergency Lighting the building will be enveloped in total darkness. The cause of the power failure may have a simple cause, such as a temporary power cut, alternately it could be as a result of a more serious problem such as a fire. Either scenario requires robust solution to ensure there is no risk of people exiting the building safely. Emergency Lighting, once triggered relies on batteries as the power source, which will remain on for many hours, or until the general power has been restored. it is essential to test your emergency lighting at least monthly as batteries among other things can develop faults. Electrical regulations change frequently to keep pace with new technology and updated risks, Falcon offer the latest Emergency Lighting and Illuminated Emergency Signage installations throughout the UK. For further information or to organise an inspection, repair or replacement, please use our contact us page.